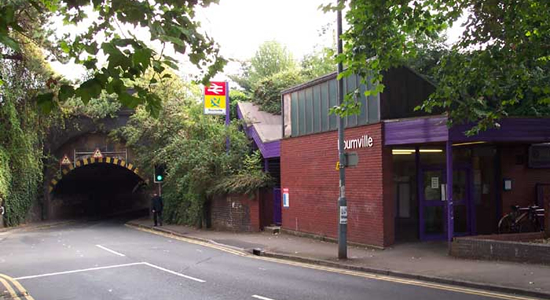 Above is a shot of Bournville Stationentrance and station building on Bournville Lane and the very narrow 'single file only' bridge taken in September 2003. Opened in 1876 on the Midland Railway's Birmingham and West Suburban Branch as 'Stirchley Street', the station became 'Stirchley Street and Bournville' in 1880 to be inline with the newly developed, and named, Bournville which was beginning to emerge through the work of George Cadbury who had opened his now famous chocolate factory on a greenfield site in 1879 and was buidling a housing estate for its workers: in 1888 it became 'Bournville and Sirchley Street' and finally 'Bournville' in 1904. 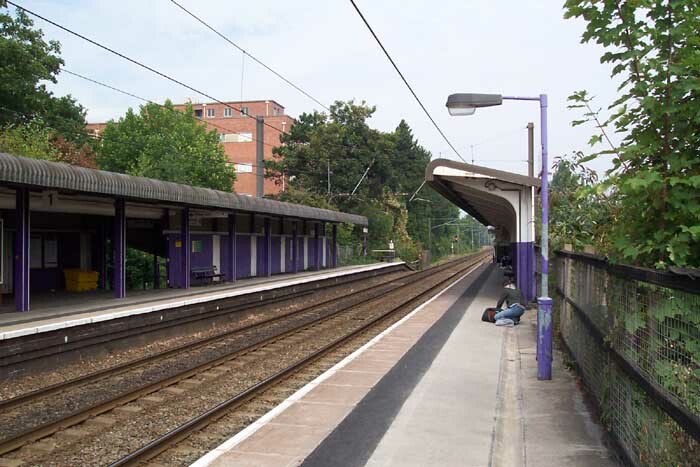 Originally only a single-track station, the line was doubled in 1885 with a new southbound platform being built in a very tight space between the existing line and the Birmingham-Worcester canal hence the rather narrow plaform! The station building, as should be apparent, is not the original but one built in the 1970s during the regeneration of what is now the Cross-City line. 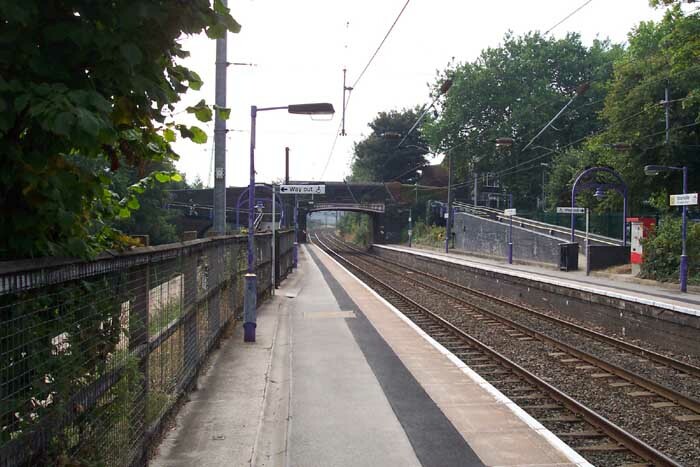 Above-left we are on the southbound platform looking towards the Mary Vale Road overbridge and Kings Norton Station. Above-right we are in the same spot but this time looking north. 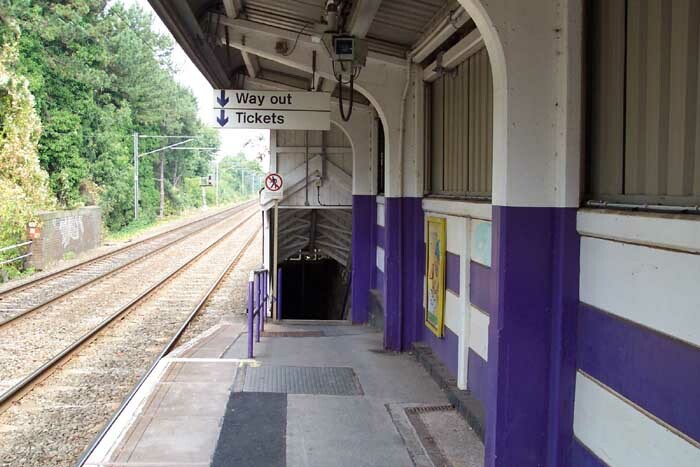 Unfortunately, black and white photography doesn't permit the inextricable link between the station and Cadburys to be evident in these photographs: the whole station is infact painted in the company's colours of white and purple! Above-left we are on the southbound platform looking towards University Station and the entrance to the platform/exit subway: note the narrowness of the platform at this point. Interestingly, just out of sight in the distance is an overbridge which once carried a line from Cadbury's own railway to their canal wharf situated just ahead and to the right of the station in this perspective. 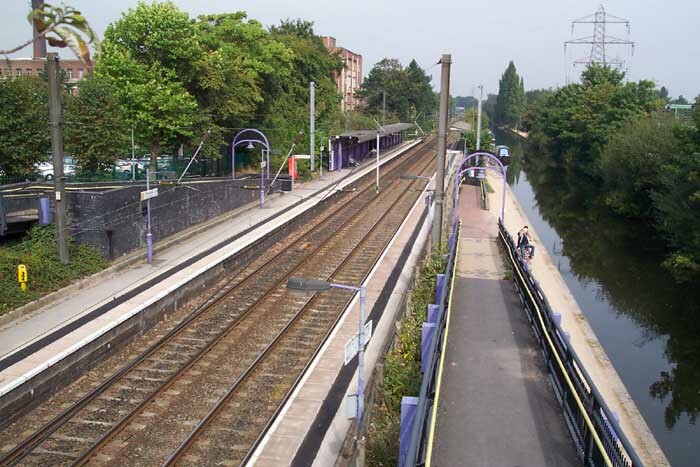 Above-right we are on the Mary Vale Road overbridge looking down the 'disabled access' ramp to the southbound platform with the canal to our right.